Ooooh, a new HG holiday recipe... plus a round-up of some classics. FANTASTIC! In a blender or food processor, grind Fiber One to a breadcrumb-like consistency. Transfer crumbs to a medium bowl. To the bowl, add all ingredients except pumpkin and flour. Stir well. In a small bowl, mix pumpkin with 1/4 cup warm water. Add pumpkin mixture to the medium bowl. Stir until blended. (This may take a while -- you'll get there!) Once combined, use your hands to knead dough into two balls. Line two extra-large baking sheets with parchment paper. Prepare a dry surface by dusting it with some of the flour. Dust a rolling pin with the flour, as well. Roll out one dough ball on the floured surface, forming a square about 10 inches by 10 inches. Using a 3-inch gingerbread-man cookie cutter, cut 16 cookies. (You'll probably have to re-roll the trimmings to cut the last few cookies.) Transfer cookies to one of the baking sheets. Repeat with the other dough ball, for a total of 32 cookies. 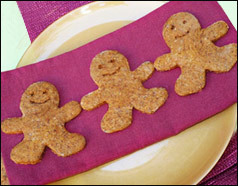 Using a toothpick, "carve" little eyes and smiles into the cookies. Bake until edges are firm, about 10 minutes. Let cool for a minute or two before removing cookies from the baking sheet. Then let cool completely. Enjoy (just not all at once)! More Food for the Festivities! Chocolate Peanut Butter Fudge - Wow 'em with 63-calorie fudge. Fancy! So-Good Chocolate Chip Softies - Between our gingerbread dudes and these things, we've got you hooked up cookie-wise. Big Fat Blueberry Muffins - Something tasty and TOTALLY low-maintenance for your family to chow down on in the AM. Love Ya Latkes - These oven-baked, butternut squash latkes are almost too good to be true. Whip up a batch and see for yourself! Cheesy Butternut Bake - Since this is the season of sharing, we want to share multiple recipes featuring butternut squash. Is that so wrong? Today, December 18th, is National Roast Suckling Pig Day. We're taking a liberal interpretation of this one and celebrating by inhaling some of our De-Pudged Pigs in a Blanket. Yum! In the spirit of giving, click "send to a friend" and pass along this valuable info!